Brick-and-mortar bookstores are important. The small, independent ones like the ones that carry my books (Laurel Bookstore, Pegasus Books, Marcus Book Stores and Bookshop Benicia) are to authors and other writers what indie music stores with events like Amoeba Records are to musicians: the first place most of us get exposure and connect with local audiences. We live in a connected, online world, but when you’re first starting the first fans and businesses to show you love are usually right where you live. That’s why I am concerned that my local brick and mortar bookstore, Laurel Bookstore is in some trouble lately. The Lucky’s that used to be across the street from Laurel Bookstore has been replaced by a Maxx Value Foods. It isn’t the only local Lucky’s to be replaced: the one at the Fruitvale Station Shopping Mall was replaced by a FoodMaxx… the names sound very similar, but the two stores are not the same. Both are “no frills” type food marts, similar to the Grocery Outlet or Walmart, which offer huge, widely-spaced warehouse like aisles of supermarket goods, but unlike FoodMaxx, which is a traditional outlet-style grocery store, MaxxValue has a fairly limited selection of inexpensive goods. The sparsely populated product aisles of the new MaxxValue are easier to navigate but lack the selection of the old, crowded Lucky’s, and the new store has been met with mixed reviews. The 14 reviews on Yelp! are all very divided. While the overall rating is 2.5 stars, it is composed almost entirely of either 4 star or 1 star reviews. When I went into the store with my mom and my friend Serena, it was very obvious why the store might be a problem for some of the previous group of core shoppers. Dedicated ominvores, my mother and I didn’t notice the strong smell of poultry rising off the meat aisle until a somewhat queasy Serena pointed it out and asked to wait outside the store for the remainder of the shopping trip. Until I read the Yelp! reviews I didn’t notice the lack of organic vegetables, because I don’t buy organic vegetables. All I noticed was the cheap produce. But even those who do shop at MaxxValue can’t buy all of our groceries there. With the exception of the meat and produce sections, the selection is far to small. For people like me, who wouldn’t be caught dead in Trader Joe’s (although I’m happy to eat any Trader Joe’s food other people give me, I just wouldn’t pay the extra money to buy it there) it’s a great value for fresh foods. However, most cheap, non-organic food eaters like me aren’t buying books across the street at Laurel Bookstore. This is a real problem for the store, which has been in business in the same location since 2001. It’s losing walk-in customers, as a lot of it’s core neighborhood customer base is shopping in the Dimond over at Farmer Joe’s or Safeway due to their dissatisfaction with the MaxxValue. 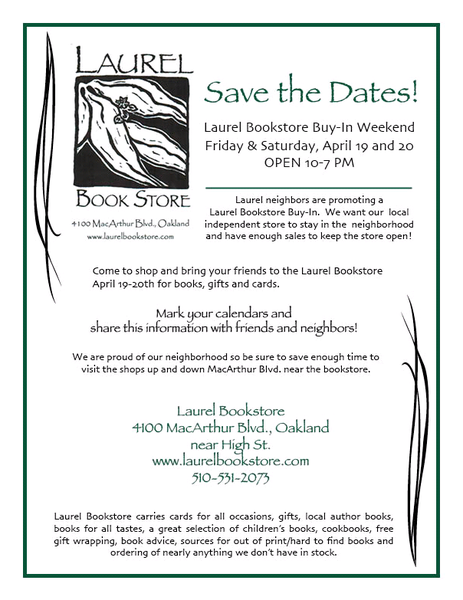 Laurel Bookstore is having an event today and tomorrow to promote the store and encourage sales. Mostly, it’s just to heighten community awareness. I hope you will be so kind as to repost this, and to drop in if you are in the area.